This is one of my favorite simple curries, that I like to dish out often when closing out a week, or just family dinner. An Indian dumpling or meatball is called a kofta, and came into the Indian culinary repertoire sometime in the 17th or 18th century through the Mughal rulers who were from Central Asia. Since their domain tended to be in the North and North Eastern states, you find koftas in the cuisines of these regions. While the meat based varieties dominate, you have several vegetarian versions as well. And of course in Eastern India, where fish rules you tend to have some signature fish based varieties. However, we slice (or should I say shape them), koftas are one of my favorite things to make. Indian koftas are made with very little fillers and tend to be gluten-free as the flour (if used) is chickpea flour. Today’ recipe is a chicken kofta, a recipe adapted from the Spices and Seasons cookbook. Gussy it up a little with a touch of light cream, serve over steamed perfectly done Basmati Rice, you might even get away with passing this off as a homey Valentine. Remember the Indian flat breads I shared with you when I began the sequence, if you threw that into the mix, I might actually be tempted to come over. The only tip that I have for you is to shape them before you start making the curry base, this allows them time to settle and consequently not break apart when being cooked. 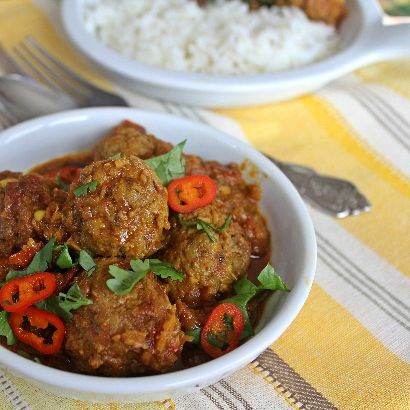 An recipe for curried Indian meatballs. 1.Pre-heat the oven to 300 degrees. 2.Mix all the ingredients for the meatballs together and shape into small walnut sized balls. Place them on a baking sheet and cook for 5 minutes at 350 degrees. This is to just bind the meatballs, rather than completely cook through. It is important not to over cook them or they will dry out. In the meantime, heat the oil on medium heat for a minute. Add in the onion and ginger and cook for 2 to 3 minutes stirring frequently. Add in the cumin, coriander and cook for 2 minutes. Add in the tomatoes, cardamom and cloves and cook on medium low heat, stirring the tomatoes occasionally to break them down to a smooth consistency for about 7 minutes. Add in the chicken koftas and cook for 5 minutes. Mix all the ingredients for the meatballs together and shape into small walnut sized balls. Place them on a baking sheet and cook for 10 minutes.